Network Marketing is a booming global business. It is a method of distribution which is now being used by many household names for the distribution of products and services as diverse as telecommunications, health and beauty products and even insurance. Network Marketing depends on cutting out "the middle man". Costs are kept to a minimum by the manufacturer (Forever Living Products) selling directly to the Distributor (us) who then sells the products to customers or uses them personally. Traditional businesses may rely on many stages to handle the products on its way from the manufacturer to the customer. Each stage increases the cost in order to make a profit. In Network Marketing the savings made by this approach are passed on to Distributors in the way of bonuses. Network Marketing relies, not on a few people making vast sales, but on many people using or retailing a small amount of product. 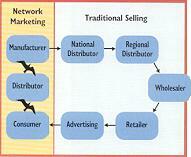 Network Marketing is said to be the fastest growing method of distribution in the world today. Globally there are several million people involved in our industry and the majority do so in combination with other forms of employment. It accounts for anything from less than 1% involvement of the population in some countries to nearly 10% in more established countries. It gives people, who do not perhaps have investment capital, the opportunity to develop substantial incomes and influence their lifestyles in a way that anything currently available to them could not. Successful Network Marketing is achieved through a simple process of duplication. It is about finding a small number of people, who want a brighter future and providing the help and support they need as they fulfil their dreams. This figure illustrates the power of numbers. On the left shows the effect of a Distributor personally introducing just two active people. Duplicate this process just 4 times and you have a team of thirty people. Introduce just one extra active person (i.e. three), duplicate this 4 times a team of 120 is achieved. Introduce two extra active people (i.e. five) duplicate these 4 times a team of 780 is achieved. There is no limit to how many times you can do this - the choice is yours.